Meme taken from (where else?) emmaorgana. → Anyone who looks at this entry has to post this meme and their current wallpaper at their LiveJournal. → Explain in five sentences why you're using that wallpaper! → Don't change your wallpaper before doing this! The point is to see what you had on. 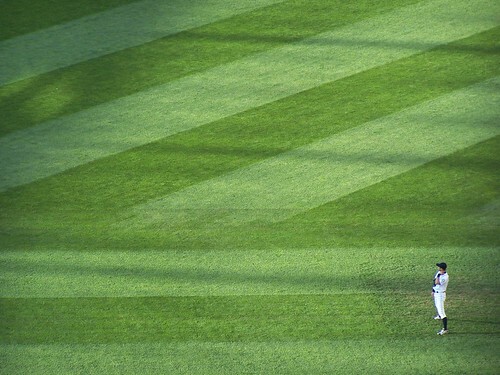 This is a picture of Seattle Mariners outfielder Ichiro Suzuki that I took during a game in Seattle back in May. It's titled "Outstanding in his field" and since he's one of the best players in baseball, that's pretty much true. I framed the shot so it would work as a wallpaper. It represents excellence, yet it's tinged with isolation and loneliness even though he's in a stadium filled with thirty-thousand people. Interpret that as you may.